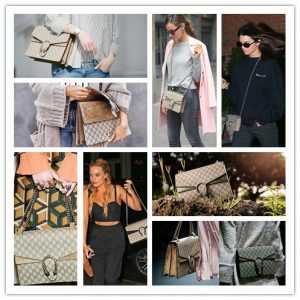 Gucci Dionysus has been a hot-selling “it” bag since it was launched in 2015, the most popular “it” bag in three years. 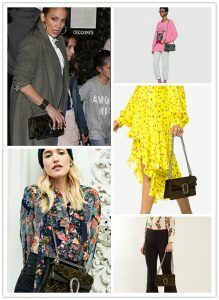 It’s the first purse designed by Alessandro Michele after he became an Italian fashion designer appointed creative director of Gucci in January 2015. The bag’s name came from the Geek God Dionysus. The Dionysus collection features tiger head buckle. Inspired by the Greek God Dionysus, Alessandro Michele designed the Dionysus collection. Dionysus is son of Zeus and Semele who was a princess with decent and elegant manner. Hera, Zeus’s principal wife, got the news that Semele was pregnant and got angry and jealous. She used a deadly trap so that Semele was burned by Zeus with divine power. Zeus was extremely sad, but he took out the baby from Semele’s womb and sewed him into his thigh. Therefore, he walks like a cripple. 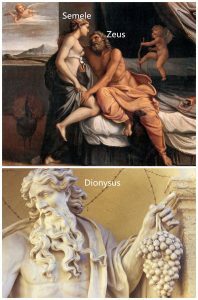 He never took out the baby until he was mature and named him “Dionysus” which means a lame person. Dionysus grew up with animals in the forest and mastered the secret of nature and the history of making wine. The wine made by him makes people forget troubles and stimulate infinity originalities. Dionysus in a chariot studded with double tigers fell in love with Princess Ariadne in Tiziano Vecellio’s work: Dionysus and Princess Ariadne. Dionysus represents dream, aesthetics and intoxicated spirit, and Dionysus culture coincides with Alessandro Michele’s art style. 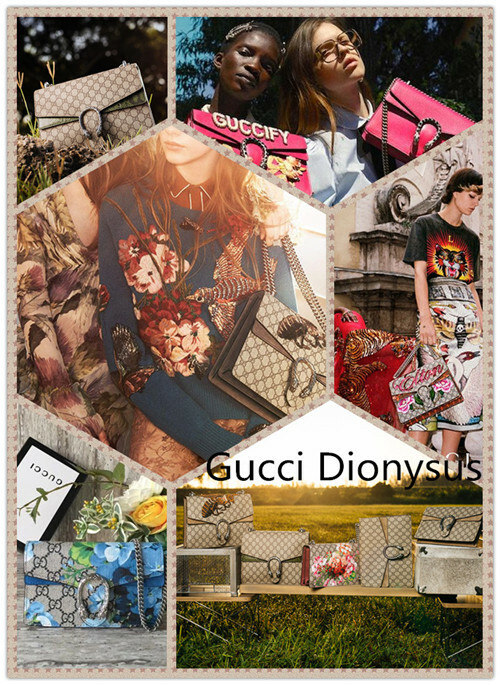 So Gucci Dionysus bag is from Dionysus culture. 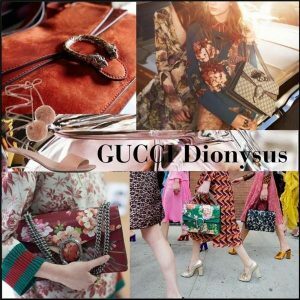 Why Is Gucci Dionysus So Popular? I summarize three reasons of being popular. First, the design with rugged and sweet traits is suitable for ladies at all ages. Second, an easy-matching “it” bag! It’s beautiful that the Dionysus bag matches with any clothes. Last, the popularity of the Dionysus is due to designers’ originalities, like embroidery, sequin. Gucci Dionysus collection has been an irreplaceable “it” bag in less than three years. Novel styles would be seen every season. I sort Gucci Dionysus into three types. Made of supreme canvas and chamois leather in different colors, the Dionysus GG is equipped with chains and tiger head buckle. A Dionysus GG supreme canvas style was launched with a thick should strap in 2016, cooler. The basic Dionysus Canvas bags are adorned with blooms print, distinctive and elegant. What’s more, its back is more gorgeous. 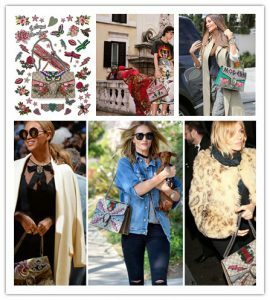 Gucci Dionysus Canvas Embroidery is an ornate model. 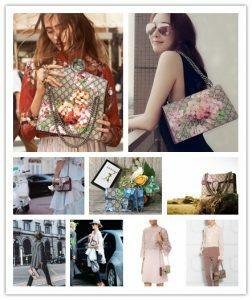 From the beginning of the bee embroidery, designers consider the Dionysus bag as a canvas, and animals and interesting patterns are applied to it. Even the lining are finished with 3D effect. It seems that designers never plan to stop their interesting creativities. Made of soft velvet, Gucci Dionysus GG Velvet expresses vintage but modern fashion attitude. The tiger head closure echoes to Dionysus culture.